As with all IMO workshop teams, Team Orange comprised of scientists and clinicians with very different backgrounds and expertise. Naturally enough, we brought different tools and approaches to such a challenging anomaly. And inevitably, we all brought our own biases as well – after all, if your tool is a hammer then every problem is a nail. As a physicist working in cancer, I was curious about potential mechanistic reasons for what we observed – and I wondered if perhaps oxygen might play a substantial role. Oxygen distributions inside tumour micro-environments are typically complex, with pockets of chronic hypoxia being a common facet in solid tumours (Vaupel and Mayer 2007; Secomb et al. 1993; 1995; Grimes et al. 2016). As a consequence, oxygen supply is generally disordered and demand higher, leading to regions of extensive hypoxia. Whilst the mechanism might be simple, the net result is intrinsically complex. This diffusion-limited hypoxia gives rise to a number of detrimental effects – tumour regions low in oxygen are much less amenable to treatment, as molecular oxygen boosts cell kill in radiotherapy through a mechanism known as oxygen fixation. It has also long been known that extensive hypoxia has a negative implication for patient prognosis (Gray et al. 1953). The reason for this is deeply evolutionary; under hypoxic conditions, tumour cells can respond to hypoxia by activating oxygen sensitive signaling pathways (Lu & Kang 2010), including hypoxia inducible factor pathways and the unfolded protein response (Mujcic et al. 2014). Yet while this is well appreciated, it isn’t immediately apparent how this might apply to a cancer such as CMML. It might even be tempting to dismiss it as a dead-end avenue. But given the ubiquity of micro-environmental influence, we opted to investigate it further in the search for potential mechanisms of ruxolitinib resistance, or at the very least to understand what factors might influence this. So if we were to search for the mechanistic fingerprint of oxygen effects, where better to look than the scene of the crime – inside the bone marrow itself. Bone marrow is relatively unusual in one respect, with a surprisingly low oxygen partial pressure, ranging typically from a low of 9 mmHg to highs of 32 mmHg (Spencer et al. 2014). To see this in perspective, typical partial pressures at the capillary wall tend to be around 40 mmHg, whereas many human organs have oxygen tensions well in excess of 150 mmHg. It’s important to note that despite this low relative oxygen tension, bone narrow is not hypoxic in the conventional sense. On top of this, if conventional hypoxia was the culprit then we would expect to see this act on the cells in narrow, with biological markers of hypoxia and the emergence of radically more aggressive phenotypes. Yet we do not — instead, we see a remarkably homogeneous cancer for which treatment eventually fails for reasons unclear. Whatever is occurring in CMML is more subtle than we’re accustomed to, and as our usual suspects don’t strike us as obviously guilty, let’s look again at how the drug ruxolitinib itself works. As Artem has outlined, the drug doesn’t attack the cancer – ruxolitinib is a Janus kinase inhibitor, and works by repressing the JAK-STAT pathway to ease the symptoms of the illness. And despite no apparent changes in treatment or the nature of the cells, its effectiveness gradually ebbs away, a case of apparently phantom resistance. What we are calling dark selection. This is all very strange – yet these ostensibly odd observations might be a consequence of us looking the wrong way at the problem. If the oxygen micro-environment interfered with the drug rather than the CMML cells, then perhaps these seemingly disparate facts might tell us another story. As ruxolitinib’s mechanism of action relies on its ability to block JAK-STAT signally, we might ask whether availability of oxygen had any impact on the potential of oxygen to modulate or diminish inhibitor efficacy. This isn’t perhaps an intuitive question, but the answer was intriguing — yes. Wang et al. (2005) had looked at the levels of JAK-STAT signaling under both low and high oxygen conditions. And in both cases, JAK-STAT signaling was increased under hypoxia. Hypoxia diminished the effectiveness of the inhibitor drastically, and this reduction impact was non-linear and markedly less effective when oxygen was scarce. This finding was intriguing, suggesting that oxygen might indeed have a role, albeit an unusual one. If treatment was to fail, there mightn’t be any need for clinical hypoxia – just a small reduction in available oxygen tension might be enough to hobble the drug’s ability to quench JAK-STAT signals. But for this to be the case there would have to be something capable of changing the oxygen profile in the bone marrow. Mechanistically, there are lots of reasons this might be the case – the first is simply that increased density of cells depletes available oxygen more than in non-cancerous marrow. Another potential reason is the strange metabolistic properties of tumour cells – oxygen consumption rate (OCR) has a distinct effect of available oxygen, and if cells had upregulated their OCR this could easily give rise to diminished oxygen availability. Both these mechanisms are plausible and seen in literature, but if this were the potential mechanism of treatment resistance, then the reduction is oxygen would have to be relatively subtle – enough that to impact the drug efficacy without significantly stressing the cells to the point where they would display hallmarks of clinical hypoxia. To look into this, we used one of my old vascular models to simulate the oxygen profile between two hypothetical blood vessels, each with a wall-pressure of 32 mmHg. 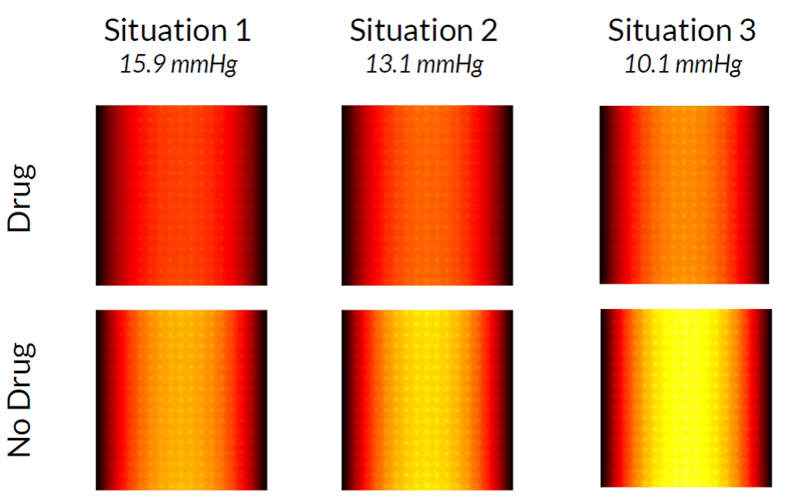 We then changed the OCR of the bulk tissue slightly, giving rise to subtly different oxygen profiles (mean p02 15.9 mmHg, 13.1 mmHg and 10.1 mmHg respectively), shown in the figure below. Crucially, in all simulated cases the global oxygen pressure is far beyond that which would be expected to have any clinical significance. Armed with a simulated oxygen profile and the experimental data on the variation of JAK-STAT inhibition with oxygen tension, we could then explore our hypothesis from a mathematical oncology perspective. Etienne Baratchart, Andrew Dhawan, Jake Taylor-King and myself worked together to produce a simplified 2D model of how these effects might interplay. In this model, ruxolitinib diffused in from the blood vessels and across a discrete matrix of cells with varying oxygen tension, each of which produced JAK-STAT signal. The drug acted to reduce this signal in a manner proportional to oxygen tension. A simplified schematic is shown at right, alongside the general form of the model PDE. With this schema in place, we were free to run a simulation – and the results were striking. These are depicted in the figure below, and indicated that even marginal differences in oxygen profile and mean pO2 had substantial impact of the efficacy of the drug. Indeed, the situation where the drug was applied at a mean pO2 of 10.1 mmHg was virtually identical to an absence of drug at a slightly higher oxygen tension (mean pO2 = 15.9 mmHg). This was a fascinating result, and consistent with the candidate hypothesis. If this were the case, then slight variability in oxygen tension could have a marked effect on treatment, and might be part of the reason for the emergence of resistance. Of course, this remains at the moment just an interesting candidate hypothesis –- we’d need a lot more evidence to state that this is the mechanism responsible. Faced with a curious problem, team Orange took a holistic approach of developing several other potential hypotheses too, three of which Artem has outlined already. What these have given us is the means to investigate whether these ideas carry any water, and to refine them prior to experimentation. Experiments could then help us determine which of our proposed ideas (if any) might explain what we observe. For instance, unusual vascular patterns or increased cellular density might allow us to gauge whether oxygen has a substantial role to play. Here, I have suggested why it may, but it’s important to note this needn’t be the mechanism — just an interesting hypothesis. We were doubly lucky this year to not only have had such a skilled and interested team, but to have ultimately won some funding to probe these questions. On a personal note, I’d like to thank Sandy Anderson for hosting this incredible event, David Basanta for his leadership, and my excellent team mates for exposing me to brilliant new ideas and approaches. Cancer is a deeply interdisciplinary area, and if we are to overcome its noxious influence a truly integrated approach is vital – the IMO workshops certainly live up to this ideal. It is truly invigorating to work with such an array of diverse minds on these critical problems. The physical rationale for the complex distribution of oxygen in a tumour is relatively straightforward – as oxygen diffuses through tissue, it is depleted by cells as a vital component in aerobic respiration (Thomlinson & Gray 1955; Tannock 1972; Grimes, Fletcher & Partridge 2014). In healthy tissue, there is generally adequate vascular supply of oxygen and no hypoxia. However, the tumour micro-environment is much more chaotic, marked by tortuous and poorly perfused vascular networks with an excess of cells. This is a special research interest of mine, but as it’s not immediately relevant to CMML I’ll not expand on it here and instead direct an interested reader to Hall and Giacca (2006) or my more recent paper on the physical mechanics (Grimes & Partridge 2015). While the precise mechanisms for oxygen’s effects on somatic evolution remain poorly understood, it is thought that these signaling pathways alter gene expression in an attempt to promote survival under adverse conditions, and ultimately allow cellular phenotypes to arise with evasive mutations, including the ability to metastasize. To compound this, hypoxia drives a haphazard form of angiogenesis, providing new routes for cancer cells to colonize (Carmeliet & Jain, 2000). The signals induced by micro-environmental hypoxia form a harsh crucible, and provide the selection pressures requisite for malignant and invasive phenotypes to arise. This is of importance for solid tumours, where spatial limitations on oxygen diffusion yield such chaotic pockets of anoxia. Note that this is related to, but not exactly the same as the Warburg effect’s link to metastasis discussed elsewhere on the blog. Radio biologically significant hypoxia is typically defined at around 2.5 mmHg (Hall & Giaccia, 2006), but this definition arises because this is the approximate cut off oxygen tension at which radiotherapy is at half its maximum efficacy. Cells can quite happily survive much lower oxygen pressures, happily undergoing mitosis as low as 0.5 mmHg (Hockel & Vaupel 2001, Grimes et al 2016 (b)). It’s important to note that Wang et al. (2005) didn’t use ruxolitinib specifically but instead a different JAK-STAT inhibitor: AG490. But for our purposes we initially assume the mechanisms are broadly similar. Carmeliet, P. & Jain, P.K. (2000). Angiogenesis in cancer and other diseases. Nature, 407(6801): 249–257, 2000. Gray, L.H., Conger, A., Ebert, M., Hornsey, S., & Scott, O. (1953). The concentration of oxygen dissolved in tissues at the time of irradiation as a factor in radiotherapy. The British Journal of Radiology, 26(312): 638–648. Grimes, D.R., Fletcher, A.G., & Partridge, M. (2014). 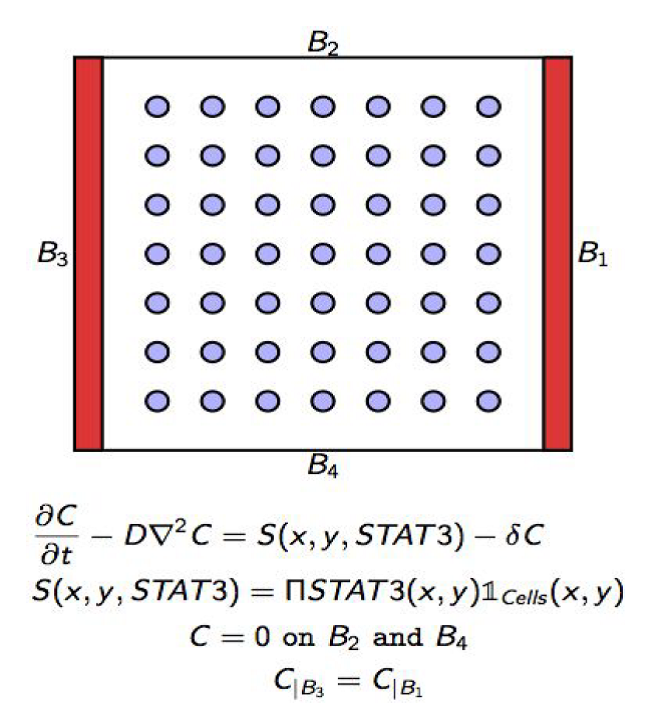 Oxygen consumption dynamics in steady-state tumour models. Royal Society Open Science: 1: 140080. Grimes, D.R., & Partridge, M. (2015). A mechanistic investigation of the oxygen fixation hypothesis and oxygen enhancement ratio. Biomedical Physics and Engineering Express, 1(4): 45209. Grimes, D.R., Kannan, P., Warren, D.R., Markelc, B., Bates, R., Muschel, R., & Partridge, M. (2016). Estimating oxygen distribution from vasculature in three-dimensional tumour tissue. Journal of The Royal Society Interface, 13: 20160070. Grimes, D.R., Kannan, P., McIntyre, A., Kavanagh, A., Siddiky, A., Wigfield, S., Harris, A. & Partridge, M. (2016). The role of oxygen in avascular tumor growth. PLoS ONE, 11(4): 1–19. Hall, E.J., & Giaccia, A.J. (2006). Radiobiology for the Radiologist. Lippincott Williams & Wilkins. Höckel, M., & Vaupel, P. (2001). Tumor hypoxia: definitions and current clinical, biologic, and molecular aspects. Journal of the National Cancer Institute, 93(4): 266-276. Lu, X. & Kang, Y. (2010). Hypoxia and hypoxia-inducible factors: master regulators of metastasis. Clinical Cancer Research, 16(24): 5928–5935. Mujcic, H., Hill, R., Koritzinsky, M., & Wouters, B. (2014) Hypoxia signaling and the metastatic phenotype. Current Molecular Medicine, 14(5): 565–579. Secomb, T.W., Hsu, R., Dewhirst, M., Klitzman, B., & Gross, J. (1993). Analysis of oxygen transport to tumor tissue by microvascular networks. International Journal of Radiation Oncology*Biology*Physics, 25(3): 481–489. Secomb, T.W., Hsu, R., Ong, E.T., Gross, J.F., & Dewhirst, M.W. (1995). Analysis of the effects of oxygen supply and demand on hypoxic fraction in tumors. Acta Oncologica, 34(3): 313–316. Spencer, J.A., Ferraro, F., Roussakis, E., Klein, A., Wu, J., Runnels, J. M., … & Yusuf, R. (2014). Direct measurement of local oxygen concentration in the bone marrow of live animals. Nature, 508(7495): 269-273. Tannock, I.F. (1972) Oxygen diffusion and the distribution of cellular radiosensitivity in tumours. The British Journal of Radiology, 45(535): 515–524. Thomlinson, R. H., & Gray, L. H. (1955). The histological structure of some human lung cancers and the possible implications for radiotherapy. British Journal of Cancer, 9(4): 539. Vaupel, P. & Mayer, A. (2007) Hypoxia in cancer: Significance and impact on clinical outcome. Cancer and Metastasis Reviews, 26(2): 225–239. Wang, G. S., Qian, G. S., Zhou, D. S., & Zhao, J. Q. (2005). JAK–STAT signaling pathway in pulmonary arterial smooth muscle cells is activated by hypoxia. Cell Biology International: 29(7): 598-603. Physicist, Science Writer, Cancer Researcher. Tweets at @drg1985 , full time Jedi Knight with foppish hair who's long succumbed to imposter syndrome. What is CMML? Are readers expected to already know or have to look it up? CMML is chronic myelomonocytic leukemia, I’ll edit this link into the post. Thanks for pointing this out. In general, this post is the third in a series after this intro and this outline of mechanisms. Those might also provide some context for this post.